This article is about steps to convert D-Link Wireless Router into Bridge mode. If you want to connect two LANs via WiFi, you need a wireless router in bridge mode. In this tutorial, I will teach you how to configure the D-Link wireless router in bridge mode to communicate with another WiFi router to connect two LAN networks. The network diagram is like this. One router is in Access Point or wireless router mode but the second router is in bridge mode. The D-link device in the bridge mode accepts a point to point communication only. It is important to remember that once we change D-Link router into bridge mode, it will not connect to other WiFi clients and its Internet port also will be disabled. Every device connected to the Ethernet ports of the D-link router will connect to the WiFi from the first Router. To learn more about this, follow the link below. It starts rebooting, and you will get following notification about changing the router IP address. You should use the new IP address 192.168.0.50 and User-Name as admin and leave password field blank. Click on Setup tab and then click on Wireless Settings. Select the WiFi connections you want to connect from the list of available networks. If the connecting network is encrypted, you need to enter the network key and then click on Save Settings. After this step, D-Link router will operate in wireless bridge mode. 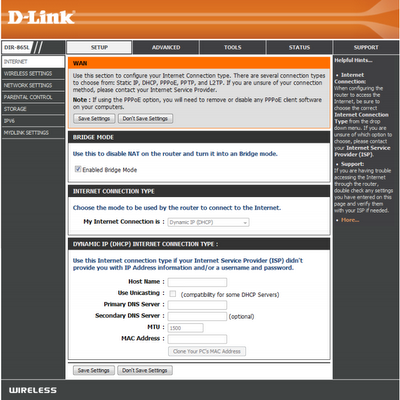 To learn more about configuring D-Link Router in normal mode, follow the link below. If you have an interest in learning the reasons and solutions for common wireless network issues, click the link below. This method helps you to connect two office networks in two different buildings via wireless. For example, if you own two offices in two adjacent buildings, you can connect both office networks by using a D-link router in wireless bridge mode. I never knew we can convert D link router in to wireless bridge mode. I thought we need AP for that. Thanks for sharing the tip. How to Convert D-Link Wireless Router in to Bridge Mode. How to set White Bell DSL Modem/Wireless Router 2Wire. Router as a Wireless Adapter Without NAT. Have you checked the wireless settings page of your d-link router ? Not all D-link wireless routers support wireless bridge / repeater mode. Have a look at the official D-link article given below.